Peter Mulryan was our informative guide on a visit to the fledgling Blackwater Distillery. Peter, the distiller and one of four directors, told us about the botanicals, 12 if I remember rightly, used in the process, including Coriander which goes “citrus-y” in the mix. Considering that citrus (dried skins) and bitter orange (also dried skins) are also used you could see why he advised against using a lemon in your gin. Lime would be a better choice. The orange skins, by the way, come from Spain, the pulp having been extracted to make marmalade. Some spices, including Cinnamon and Cardamom, are also used. Juniper is perhaps the best known element, having been traditionally used to make gin, and indeed provides the dominant flavour. Got my hands on a juniper berry and when I crushed it between the fingers it began to feel oily. It is this oil that is extracted and used. Three roots help complete the mix, including liquorice and angelica which “tastes kind of gin-ny”. And if you thought that this was the first time that these exotic botanicals have reached the beautiful banks of the Blackwater, you'd be mistaken. Peter related the remarkable story of the White family from Waterford who, in the 18th and 19th centuries, imported spices, some from faraway places, and distributed them widely, even sending their own boats up the Blackwater with spice consignments for the many big houses on its banks. The stills are small here, so small they even have names. 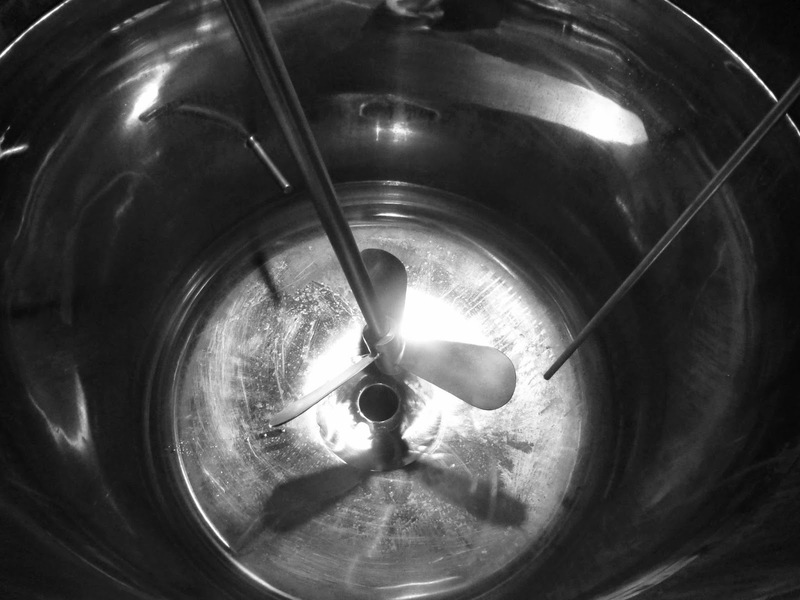 Distillation though happens quickly and you can make a decent size batch of gin in a day. By the way, there is a reason why most stills are made of copper. Peter: “Copper softens the mouthfeel. The alcohol won’t ‘burn’ you”, he told us. Aside from the stills, they also have a bottling machine on-site. 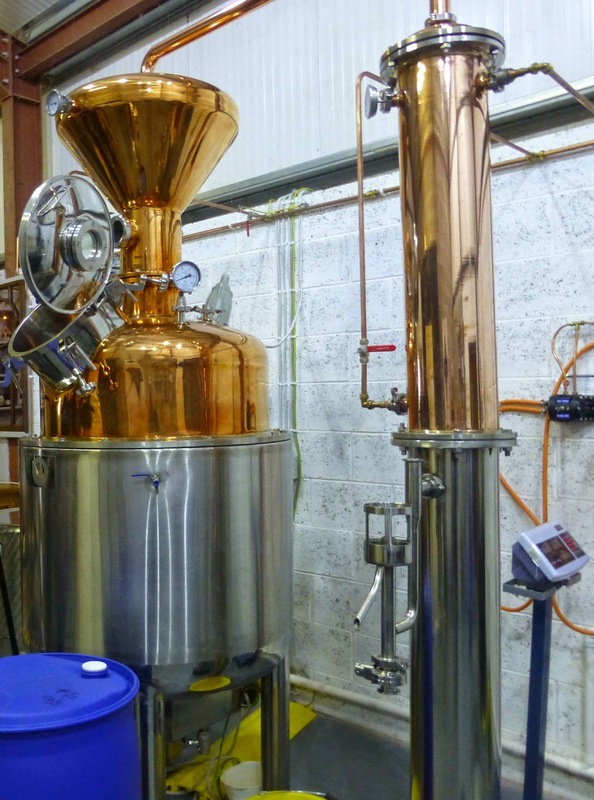 Already, the new distillery has cooperated with local brewers, including Dungarvan Brewing Company, as it seeks to position itself away from the really big distillers with which it cannot compete on price. Still and, right, cooling tower. And Blackwater can certainly be different as I found out with the next few tastings. 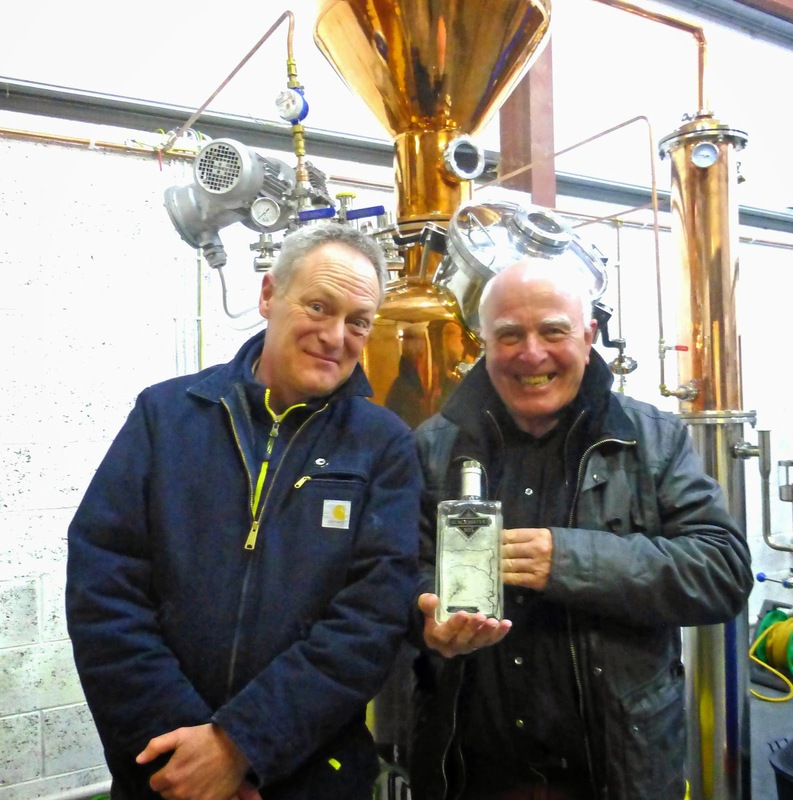 First up was the Curious Still vodka distilled from a double IPA by Black’s of Kinsale. “That is taking the bland out of vodka,” said one obviously impressed taster in our small group. Now we were on to Poteen, called the Spirit of West Waterford, made from local ingredients, and recently subject to government regulations. This was based on a hop-free oatmeal stout, brewed by Dungarvan Brewing Company. It also contains local barley, Flahavan’s oats and "a smidgen of molasses". This “very soft” drink, with an ABV of 43%, was such a hit at the recent West Waterford Festival of Food that the plan is “to move it into commercial production” in the months ahead. And there is even better news to come. Peter proudly showed us a few small casks made in Finland from juniper wood (the wood itself imported from Serbia). It is hard to get enough of the timber as juniper is a bush, not a tree. An initial batch filled one of the casks and has been a success, “a great gin”, and production of this will also be scaled up. One way of being different. Small cask, made from juniper. And whiskey, Well, no whisky yet. Remember you have to wait three years and one day to have your whiskey approved as Irish Whiskey or as Irish Whisky as Peter would spell it. Plans are well advanced but you won't find their whisky on the shelves anytime soon. 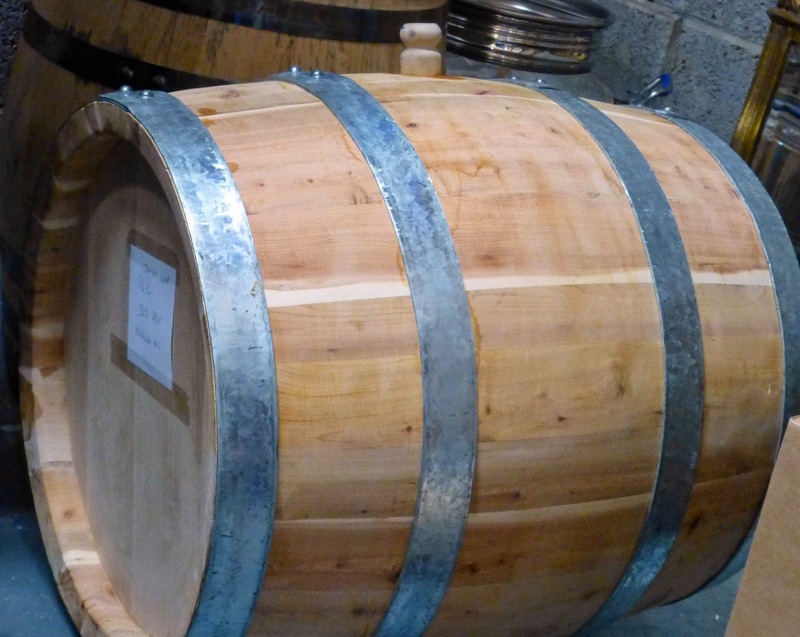 At present, you may pre-buy one of a limited number of 50 litre casks. “We offer people a choice of seven whisky styles in a choice of wood finishes,” says Peter. These won't be any old whiskey. You’ll be offered anything from Single Malt to a peated Pot Still Irish. Check out their website http://blackwaterdistillery.ie for details. Innovation is the name of the game here. Peter, a native of nearby Conna, learned the trade in Scotland and that knowledge and his enthusiasm are now being let loose on the final big bend of the Blackwater. Watch out for the heron silhouetted on their bottles, coming to a shelf near you. * Blackwater No. 5 is distributed by Classic Drinks. From the green corner of Spain, facing the wet Atlantic and with Portugal to the south, this wine is Very Highly Recommended. It is sharp and tingly with beautiful white fruit flavours, brilliant acidity and a refreshing fresh and clean finish. May be something in that yarn. May well be some of those minerals in this wine. 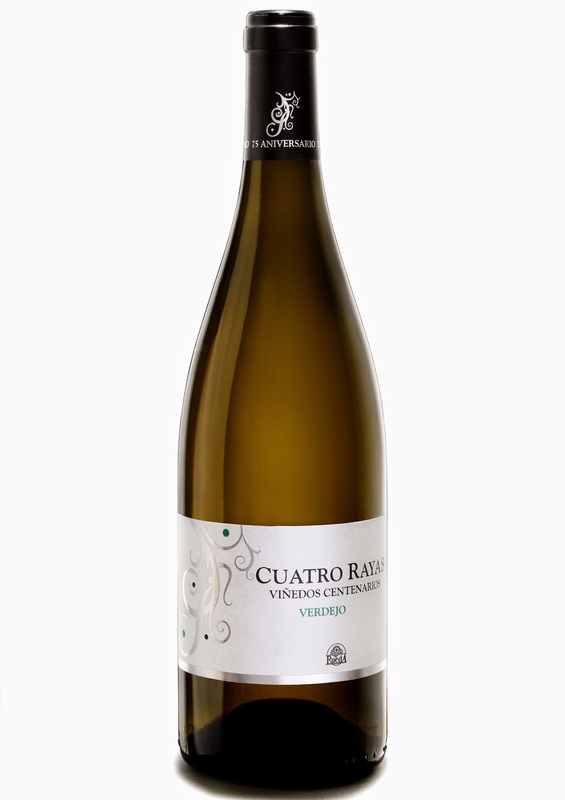 Cuatro Rayas Viñedos Centenarios Verdejo 2012 (Ruedo DO), 12.5%, €14.99, Bubble Bros.
Colour is a medium gold with greenish hue, many microbubbles. It is fresh and powerful on the nose, “a varietal characteristic” I’m told! Quite a mouthful of flavour - melon, citrus, herb (fennel). No shortage of acidity either. It is well balanced, with a little spirtz (those little bubbles earning their keep) and the citrus notes continue right through the long finalé. Refreshing and Very Highly Recommended. Verdejo is the historic grape of Rueda and the fruit for this was picked from vines with an average age of 80 years, some of them over 100 years. This wine is found in top restaurants in the Basque area and the producers are sponsors of Real Valladolid soccer club. Valladolid are second division, the wine is first! No bother getting your hands on rhubarb these days. It's is all over the place, including the farmers markets. 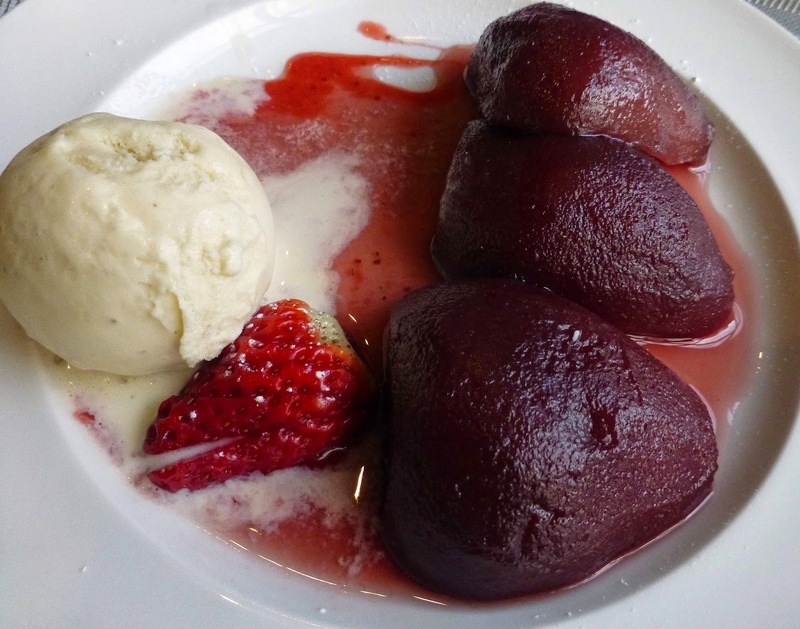 You'll see it on the dessert list in virtually every restaurant. And of course many of us grow it in the back garden. And when it comes into season, as it is now, you'll quite possibly have too much of it on your hands. It freezes well of course. One way we have of using the excess is to make jam. 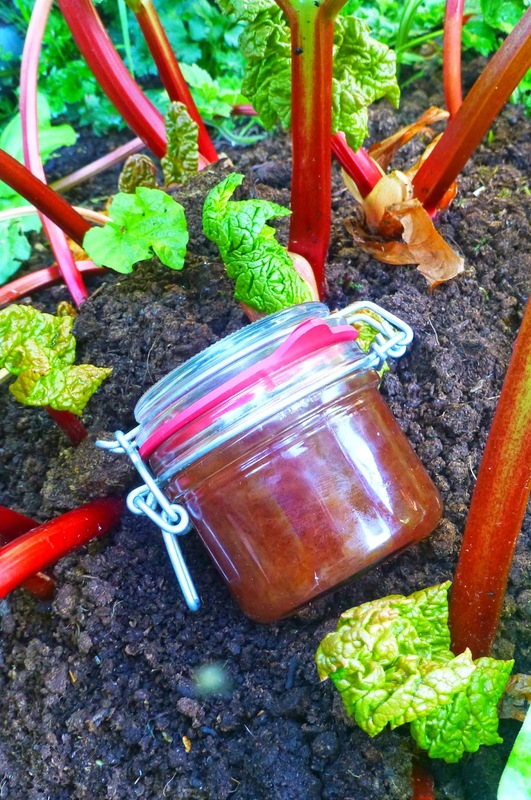 Two years or so back, thanks to Dermot O'Sullivan, known to many of you on Twitter as @Gas_mark_seven, we got an excellent recipe in which he uses vanilla with the rhubarb. That jam is our Taste of the Week. You can find the recipe, and more, on his website here. Thank you Dermot! For 35 years now, Jacques has been setting the standard for restaurants in Cork. With the Barrys' unswerving commitment to local produce and high class cooking, it looks as if the calm and comfortable Phoenix Street venue will be the benchmark for years to come. Was in there at the weekend. There were happy sounds in the main restaurant and, going by the twitter reaction, these were matched by the murmurs of approval in their adjoining small-plate room that opens onto Oliver Plunkett Street. You may access both from each street. But be sure to book. This is a popular spot, particularly towards the weekend. I started to study the menu and was immediately struck by the quality of the starter selection, that little bit different. 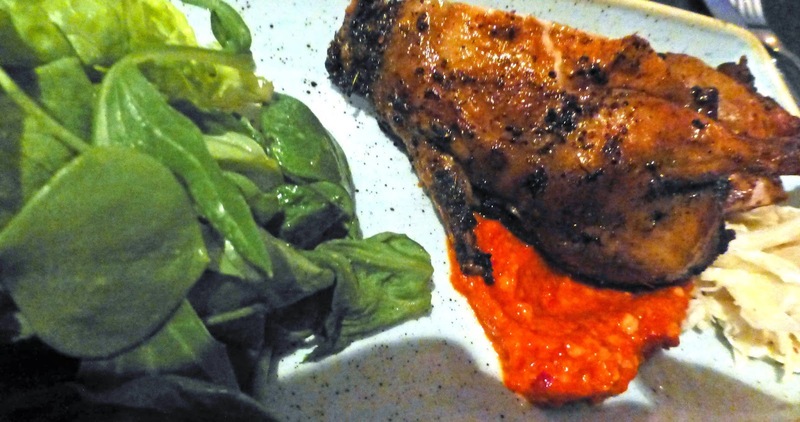 I picked the Barbecued Smoked Quail with a sauce romesco (€9.90). This was superb, a tempting whiff from the smoke, and the flavours were spot-on, the Barbecue element was just so well judged, not too heavy, not too light, the sauce and salad were perfect as well. CL’s starter was Knockalara Sheeps Cheese, pickled courgette, roast beets, crushed potato and praline (9.90). Again, this was so well put together, the Waterford cheese evenly scattered through the other elements and she was particularly surprised and pleased with the pickled courgette. 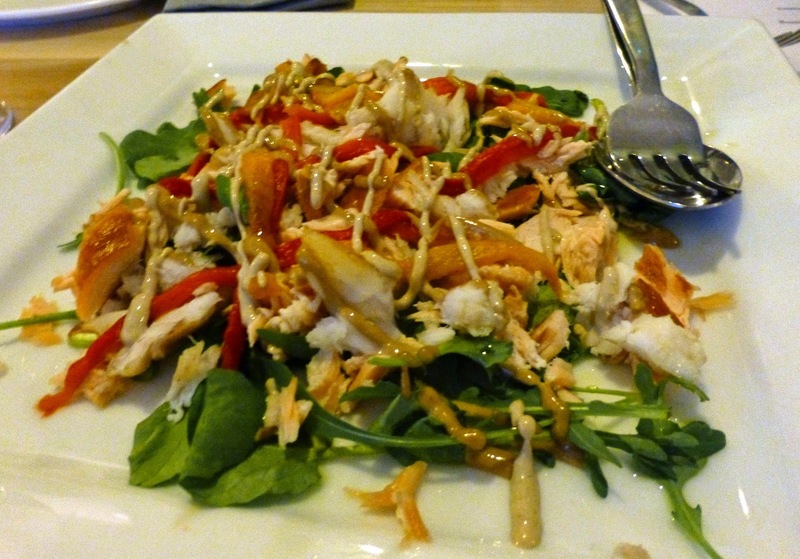 We had been looking at the Fresh Crab Salad, served with Bushby’s Strawberries (from West Cork), avocado, lime and pumpkin seed (12.90). Later, another customer told me enthusiastically that this was delicious. Other starters included Fresh Castletownbere Scallops, Fresh Mussels (with white wine and pepperonata) and Organic Purple Sprouting Broccoli (with fried duck egg and Hollandaise). Spoiled for choice! And it is much the same with the main courses. Goatsbridge Trout and East Ferry Duck Breast featured as did a Ribeye Steak to share, also a Red Wine and Mushroom Risotto and a Brace of Quail (with Japanese Style Noodles & Pak Choy). And more, including their own special Irish Stew. 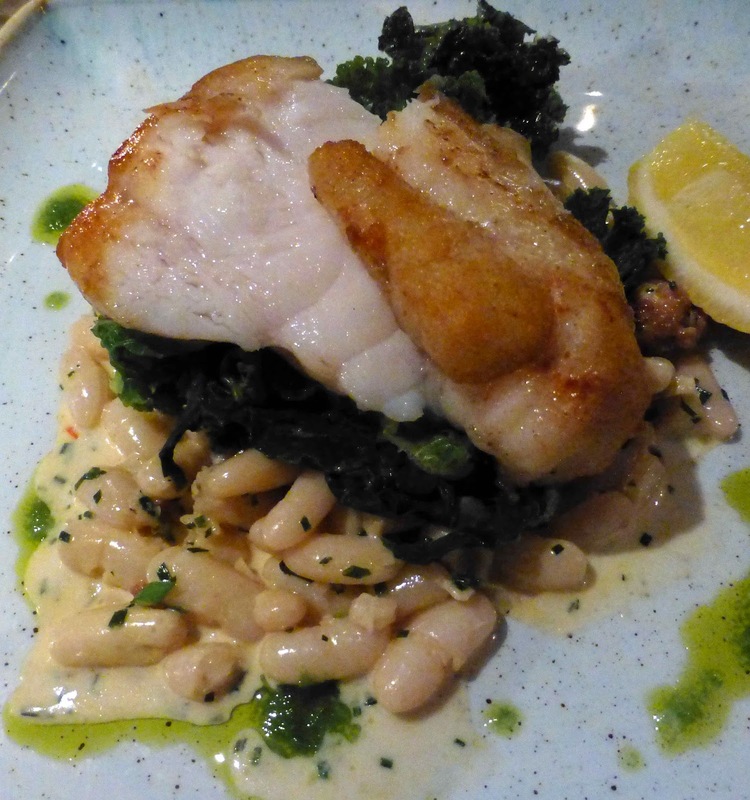 There were also a couple of fish dishes and we both agreed on the Tuscan Fresh Monkfish with cannellini beans, Italian Sausage and a wild garlic pesto. Exquisite. Bellissimo. A superb combination of flavours and textures and that little bit of pesto played quite a role. Desserts? I’m sure they were brilliant but we didn't even look! One can have too much of a good thing here. Next time, maybe. 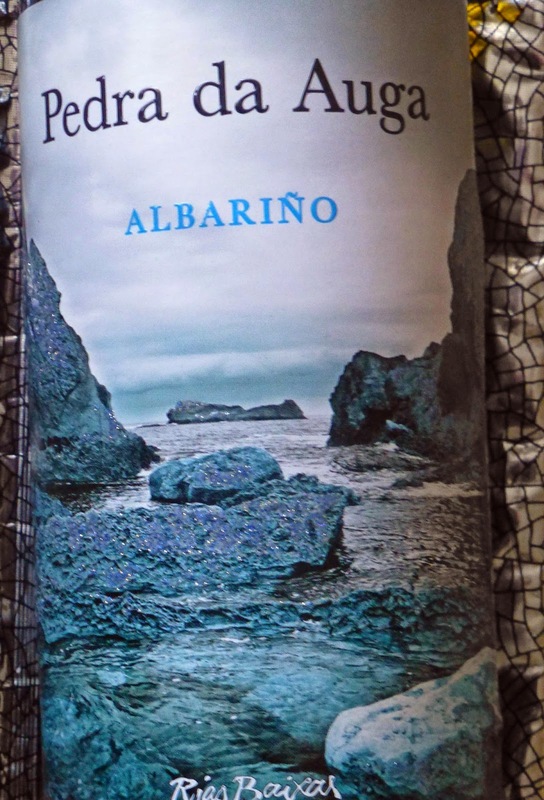 Earlier, we did have a generous glass of their Albarino, sunshine and stone on the tongue and in the throat, great with the fish. Jacques Restaurant is located at the heart of Cork City near the G.P.O. They are open Monday 10am - 4pm and Tuesday - Saturday 10am - 10pm. Lunch is from 12pm - 4pm, side plates and tapas from 5pm to 10pm and the evening dinner menu is available between 6pm and 10pm. Very Highly Recommended. If you’d like to get a good idea of the place, why not try the €24 Two Course Dinner? Or some of their small plates and tapas? So said Avril Allshire during our recent visit to the Rosscarbery farm that she runs with husband Willie and their two sons William and Maurice. 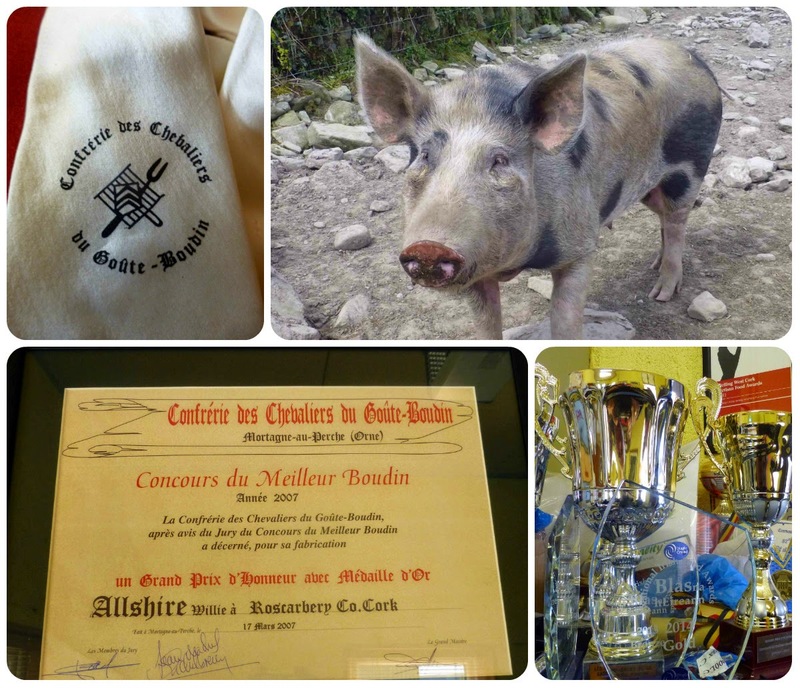 The small farm is home to two related enterprises: Caherbeg Free Range Pork and Rosscarbery Recipes. It is also the place where the young sons practice on their racing quads! 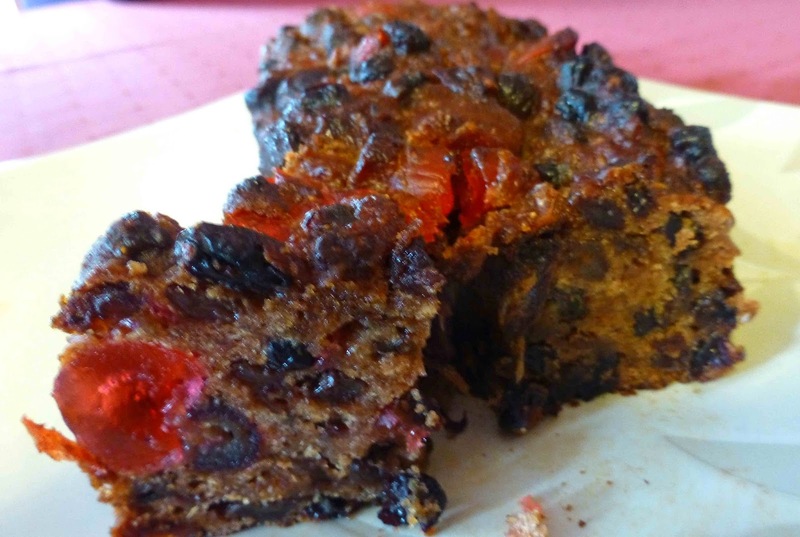 Pork Fruit Cake. Secret Recipe! Avril was talking to me in her own home, surrounded by shelves and shelves of books, many of them food related. 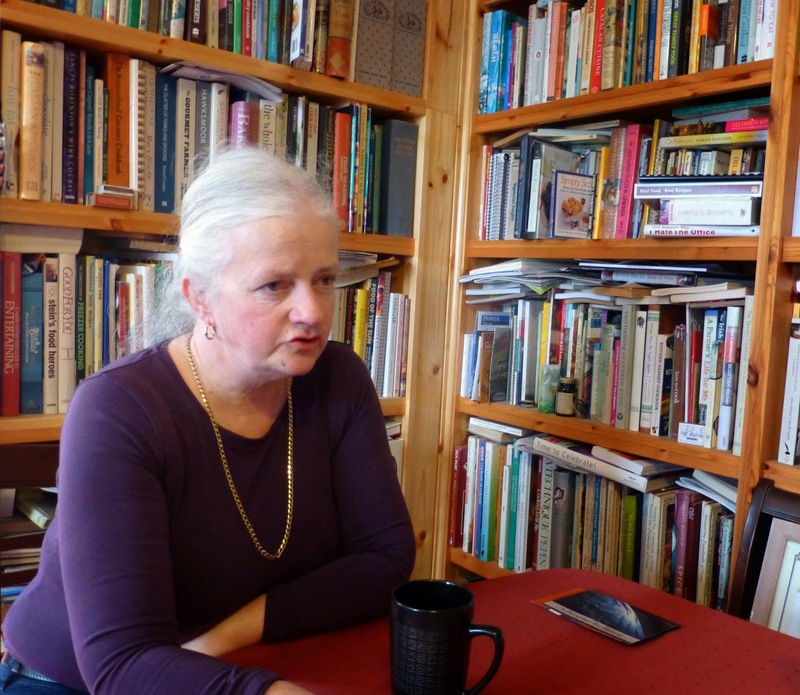 No surprise either to see that she is a big fan of Joanna Blythman, the English writer who constantly exposes the con-men of the big-food world and who will again appear at the 2015 Ballymaloe Lit-Fest next month. Avril could well write a recipe book herself. She agreed with me that food producers should provide recipes to customers but only if they have something new to add. She certainly has and you’ll see quite a few of them on her Rosscarbery Recipes blog. But there is one that she won't be publishing, won't be sharing! As we spoke we were treated to a slice of what looked like a normal fruit cake. “Has the success of any particular product surprised you?”, I asked. We discussed trends in the business.”Six or seven years ago, you could not give away belly of pork. Then the recession hit and everybody wanted it. The Caherbeg herd is quite small. We have limited numbers and not that much belly and so the Celtic Ross have exclusivity on our belly.” We had enjoyed that special dish in the local hotel the previous evening and it is worth travelling for! Then it was time to take a tour of the free range pigs (a mixture of breeds including Gloucester Old Spot, Tamworth and Kune-Kune) and we met some of the main characters including Spots, the mammy of many of them, and Timmy, the daddy. Pigs are not the only animals here. We met the dog and some of the five cats. And also Maa-aa, the growing lamb that they adopted from a neighbouring farm after its mother had rejected it. Maa-aa has been given a job! She'll be keeping the grass and weeds in control in their orchard! Two legs or four, you have to pull your weight in Caherbeg! A Taste of Tuscany. Warm, soft, and beautiful. 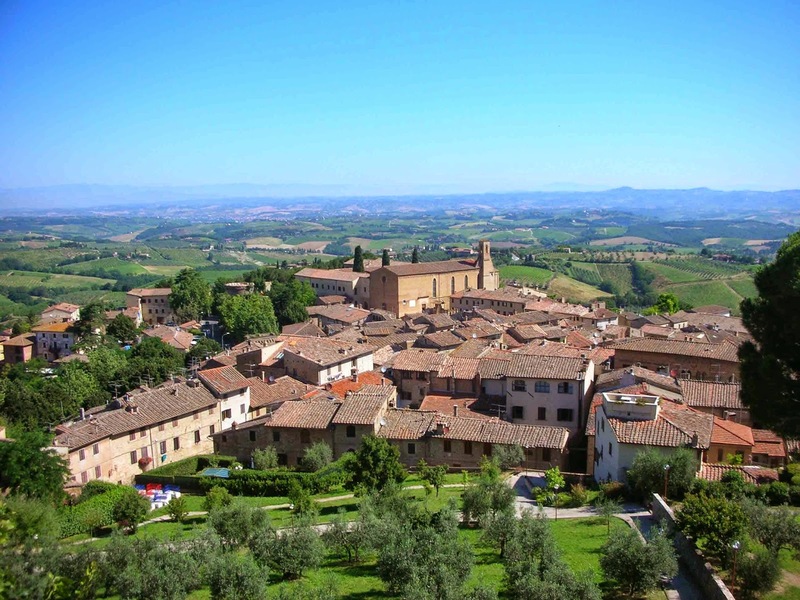 Tuscan wines feature in the current Italian wine sale at SuperValu (on until April 29th). I copied the warm, soft and beautiful from one of the bottles and it refers to the region but could well apply to the wines below. The Il Capolavoro is another gem and the Prosecco is well worth checking out. If you want a simple very gluggable wine at under a tenner, take a punt on this fresh and fruity red from the warm and beautiful Italian area of Tuscany. Made from the area’s best known grape Sangiovese (familiar to many of you through Chianti), this medium bodied red, new to SuperValu, is an excellent drop and recommended. This is another Tuscan red, similar in style to Chianti and made mostly from Sangiovese. It is more aromatic than the Pani. On the palate, it is smooth, fruity and dry, more intense than the Pani and with a longer finish. Full bodied with fine tannins, this is highly recommended. Perhaps get the Pani for the party, and a bottle or two of this for yourself! This palate pleasing beauty is new to SuperValu but could be turning up there for years to come. 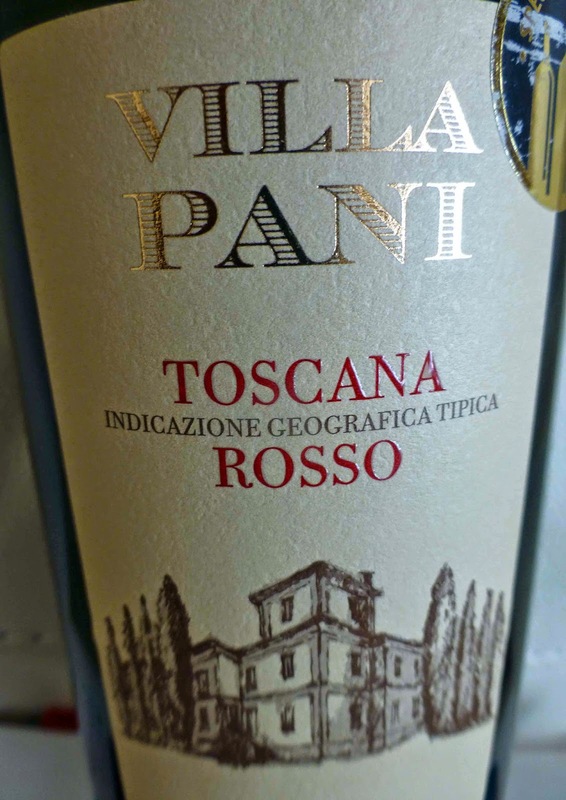 It is produced from grapes that have been partially dried (appassimento) and the result is a rich red colour and, more importantly, a greater concentration of fruit flavours. And that concentration means a very pleasant easy drinking wine with a little spice both on nose and palate. Add in a silky mouthfeel and you've got a winner. Very Highly Recommended.. 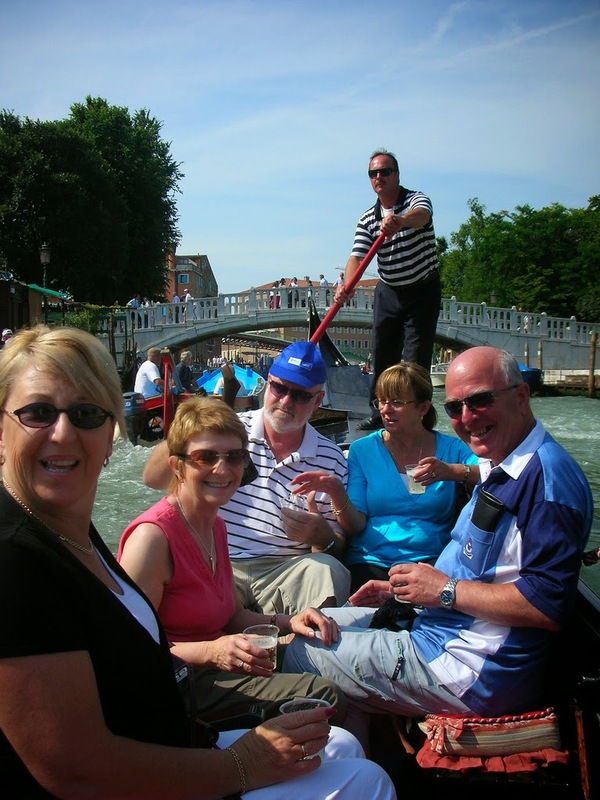 If ever you've been lucky enough to visit Venice and unlucky enough to see the way the gondoliers handle the Prosecco they dish out to tourist groups, then your respect for the famous Italian sparkling wine took a nosedive. At least, that was the case with me. And the respect didn't improve when I tasted some of the feeble stuff served up at some receptions. But that respect is on the rise again, thanks to this Lunetta. The blurb promises peach and apple on the nose and it is delivered. No shortage of small bubbles either. And it also delivers on the palate and through to a decent finish as well. This is a pretty good example, is well priced and Highly Recommended. If you're at the Mahon Point Farmers Market this Thursday, you'll find our delicious Taste of the Week at Clare O'Brien's Gan Gluten stall. Gan Gluten are makers, bakers, and home caterers of Gluten and Wheat free foods. 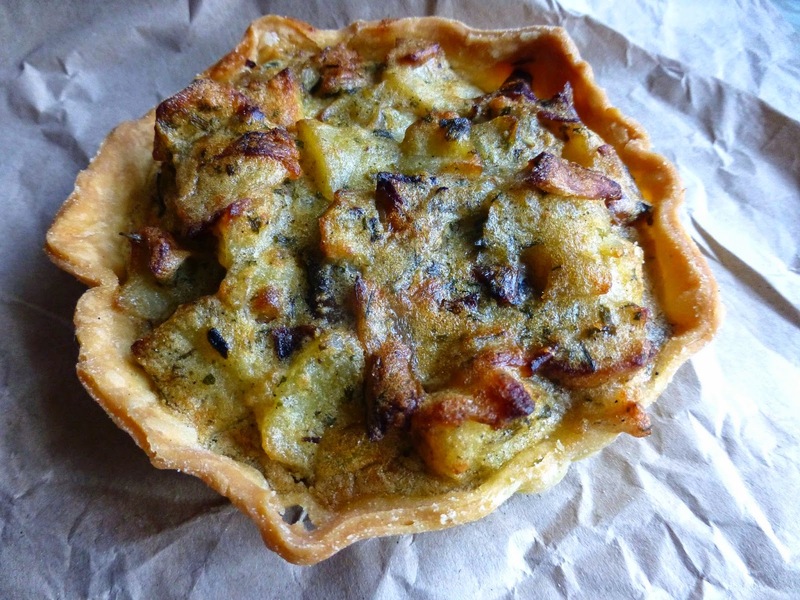 This is one of our favourites and can be a standalone lunch. Could even be the basis of a more substantial meal, if you add a salad for instance. Either way, it is well worth a try. Clare will be delighted to advise you on this and her other foods. California Wines Charity event in Galway! Edouard Leach (left) and Billy Forrester. Zamora got its wine events off to a great start with a superb Burgundy tasting event at the new Academy Street venue last Monday. The top end wines, three white and three red, came via Bubble Brothers and Maison Francoise Chauvenet who were ably represented by Edouard Leach. And Edouard’s task of showcasing the marvellous Chardonnay and Pinot Noir of the region was made all the easier by the matching food served up by the Zamora kitchen under the direction of Pat Browne of Ballymaloe Cookery School. Burgundy, unlike Bordeaux, is a land of small plots. There are some 3,500 growers with an average 6 hectares. Once it was the the negociants who dominated but now 1000 growers bottle themselves. As the growers go for more control at the end of the operation, so the negociants seek more control towards the start. In the meantime, Maison Francoise Chauvenet brings together grapes from various parcels and makes some brilliant wines and those on show at Zamora were made from Chardonnay and Pinot Noir. First up was the Marguerite de Bourgogne Chardonnay (2013). 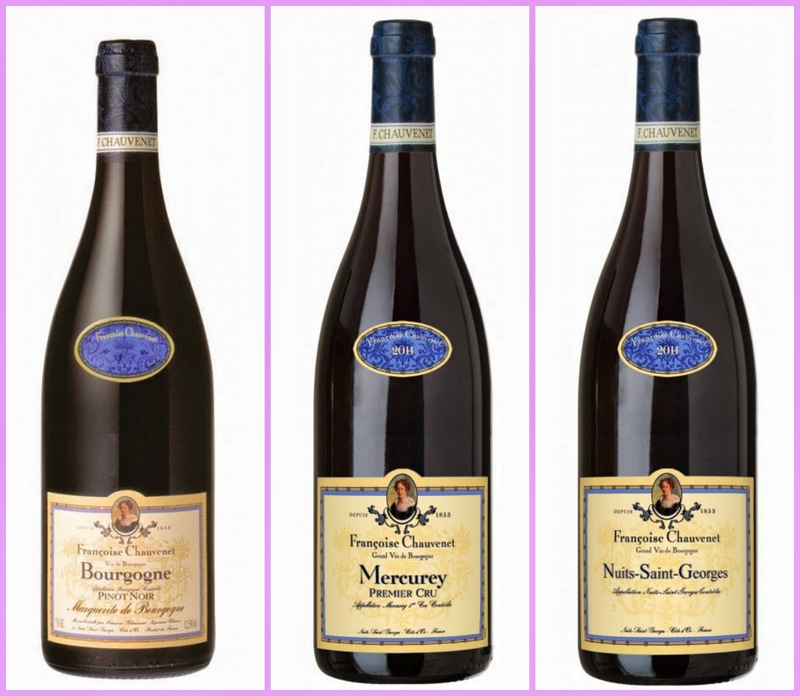 This is the signature house blend of wine from four Cotes de Beaune vineyards. Edouard said it sets the style and is drinking perfectly now. This was matched with A salad of Jerusalem Artichokes with smoked almonds and preserved lemon dressing. Simple, but an excellent match. We were off to a very good start indeed. And it got better. The kitchen delivered their Carrigcleena Duck Liver Paté with crostini to pair with the Pouilly-Fuisse 2013. Edouard: “This is considerable step-up. 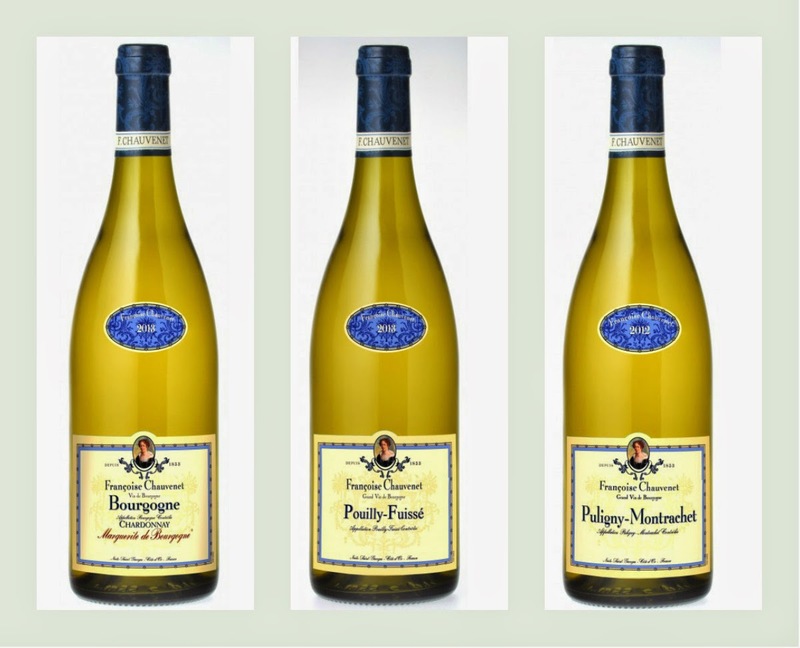 The fruit is more concentrated and it goes well with the paté.” Chauvenet themselves say this is the undoubted king of the Maconnais region and Edouard emphasised that the quality here is down to a very deliberate low yield policy. Our next visit was to the small village of Puligny-Montrachet, one of the places in the famous triangle near Beaune. 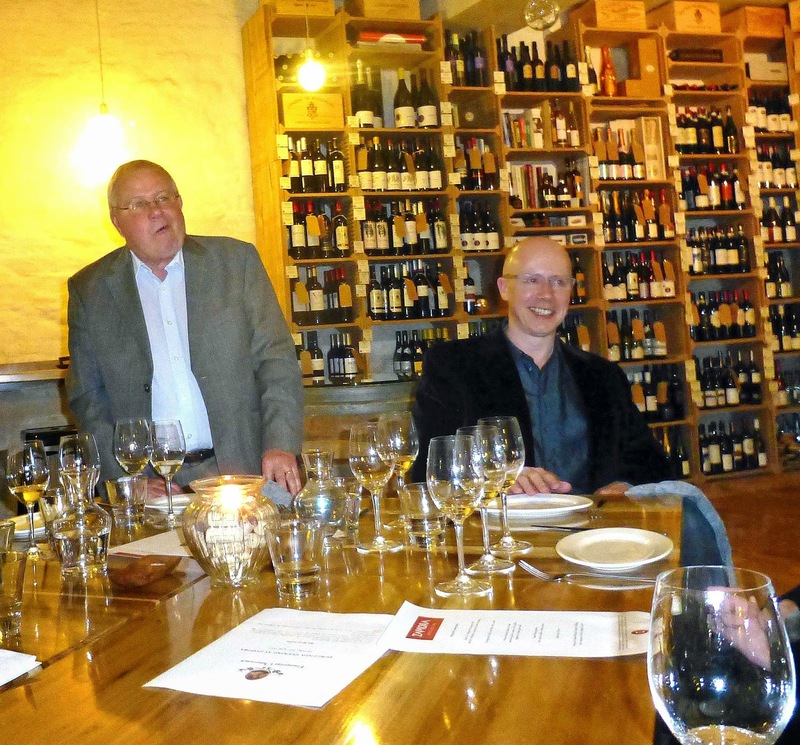 “There is a huge demand for the triangle wines”, Edouard said. “This 2012 is slowly opening up and, in two or three years time, it will be even better, will have attained full complexity.” Not bad as it was though and a serious partner with the House smoked Salmon and Hake, served with seasonal greens, roasted red and yellow peppers and a black garlic aioli. Now we were on to the reds. Would they match up? Would they what? Billy Forrester of Bubble Brothers introduced the first, the entry level Marguerite de Bourgogne Pinot Noir 2013. He was very proud of it: “A wonderful old world Pinot Noir. 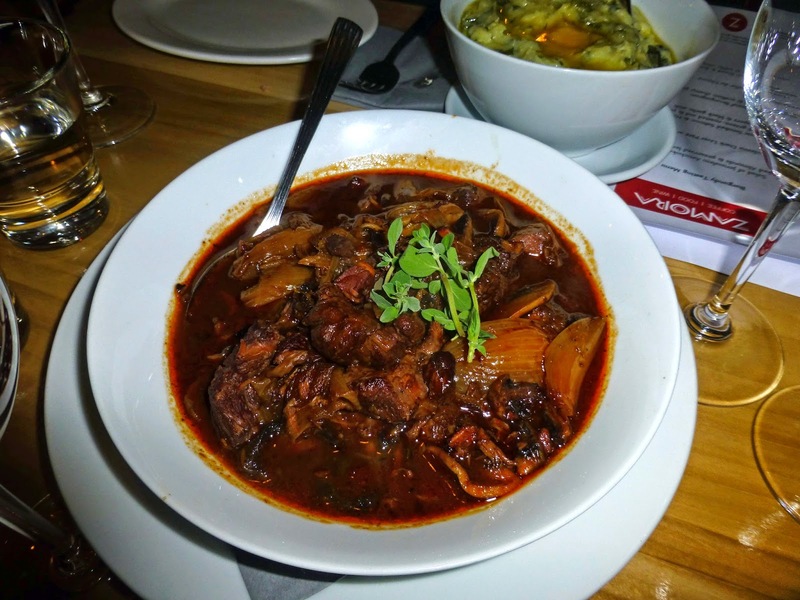 Delicious.” He must have been proud too of the matching dish: Boeuf Bourguignon with Kale and scallion champ potato. We could have been in Lyon! Edouard was somewhat puzzled by the fact that the next wine, the Mercurey 1er Cru (2013), was not so popular in Ireland. Mercurey is the best red wine village in the Cote Chalonnaise, between Beaune and Macon and “this is a huge seller in France, Belgium and Holland. 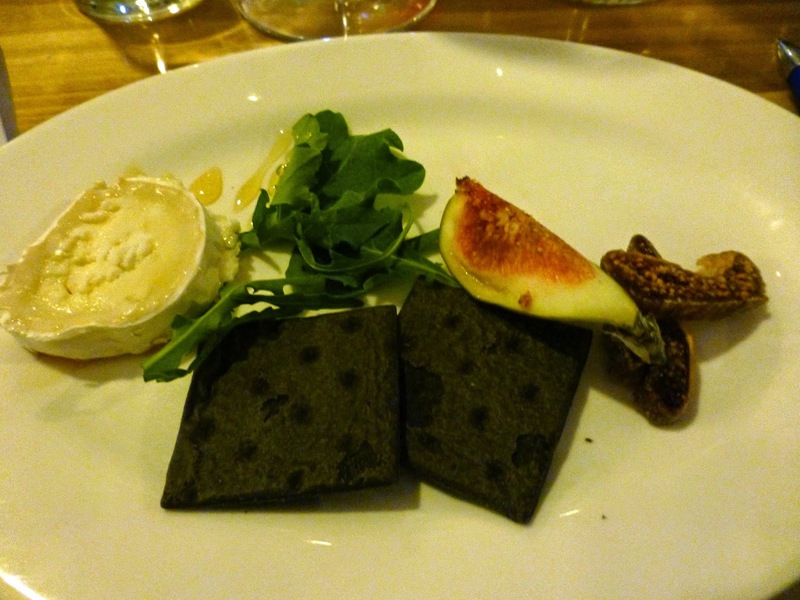 It is quite soft, nice and generous.” And went well with the soft and mild Buche de Chevre. Both the kitchen and the wine company came up with a terrific finalé. 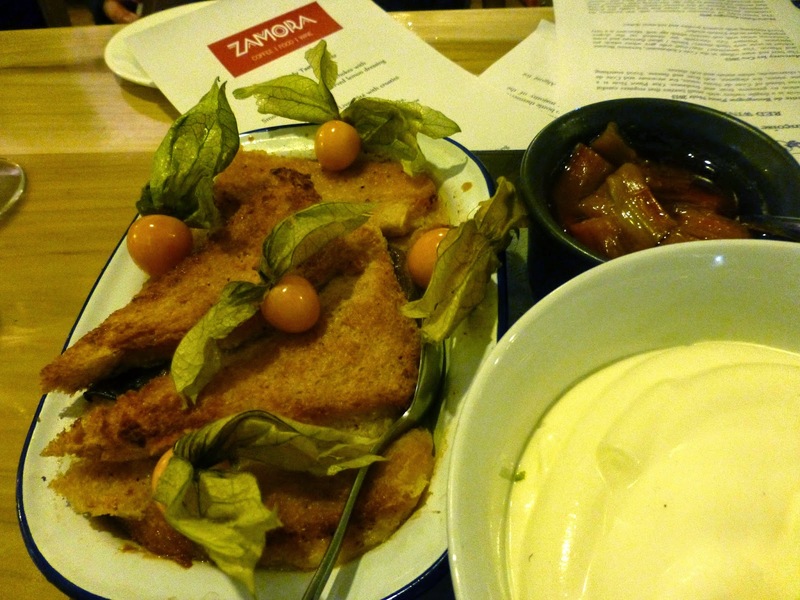 Zamora’s final contribution was an Organic Rhubarb Bread and Butter Pudding, with compote and softly whipped cream. A dessert delight. And the final wine was a very serious one: Nuits-Saint-Georges 2011. Edouard advised: “This needs time. It is still relatively closed, needs more age”. And speaking of age, he had some advice if you are thinking of keeping a few bottles of this. “Pinot Noir is very fragile, can lose everything if kept too long. If you have a case, use one bottle every year!”. Though, nowadays, quite a few areas around the world are making excellent Chardonnay and far fewer areas Pinot Noir, you will still hear that Burgundy is the spiritual home of both. Don't think there were too many arguing with that after this particular evening. The partnership between Bubble Bros and Maison Chauvet is a relatively recent one but is has started well with the promise of other excellent wines to come. Currently, there is ten per cent off the Chauvenet wines. So do keep an eye on their website for all the latest news from Burgundy. And also for news of further wine evenings at Zamora. By the way, I always thought that Cotes d’Or meant golden slope or golden hillside. But I just read in The Finest Wines of Burgundy by Bill Nanson that it is actually a contraction of Cote d’Orient - East-facing Hillside. I could have asked Edouard had I read that before the evening! It was sunshine all the way for last week's two day excursion to West Cork. It looks as if there is no shortage of sunshine this week either. Once we knew the weather was “settled” we determined to re-visit two islands, Garnish near Glengarriff and Sherkin near Baltimore. 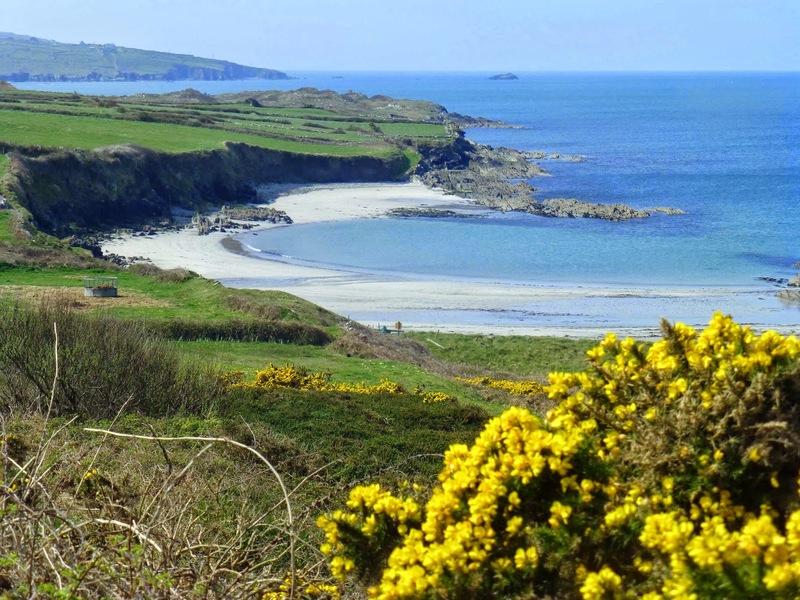 West Cork of course has many more islands and most have a ferry service. 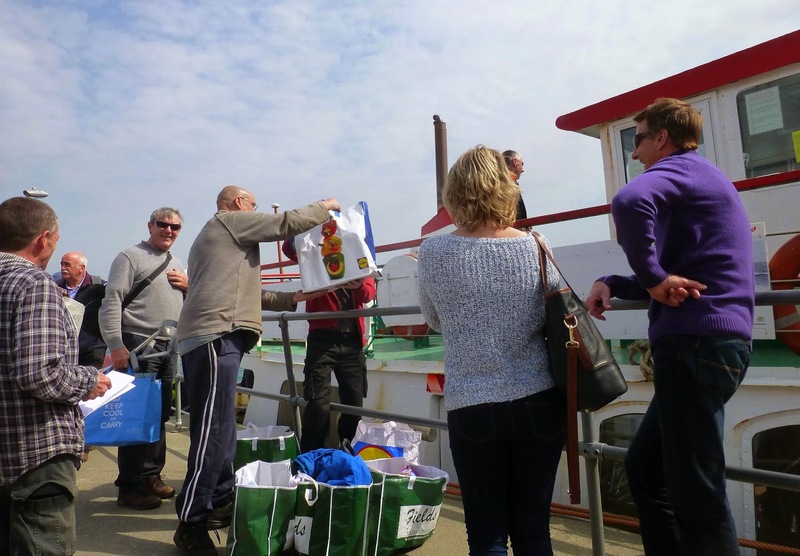 Check here for island and ferry details and do look out also for the Ten Island Tour. Our base was the Celtic Ross in Rosscarbery but Garnish was our first destination so we took the R585 via Crookstown and headed off down on the old Bantry line. On reaching Kealkil, where our road joins the R584 from Macroom, we felt the need for a quick pit-stop as we did have a specific time for the boat from Glengarriff. At the junction we spotted a board saying Cully & Sully Soup and Brown Bread for three euro. The Gala shop, also the Post Office, is right there and, within minutes, on the seats outside, we were tucking in to a tasty lunch, great value too. On then to Glengarriff where we caught the ferry (€10.00) from the Blue Pool to Garnish. 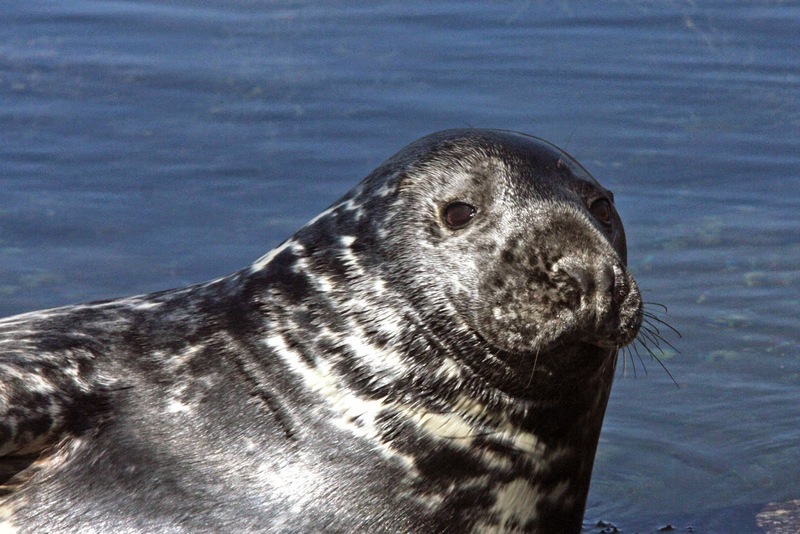 But first there were a couple of stops to see the many seals basking on the rocks around Seal Island. Lots of close-ups taken! 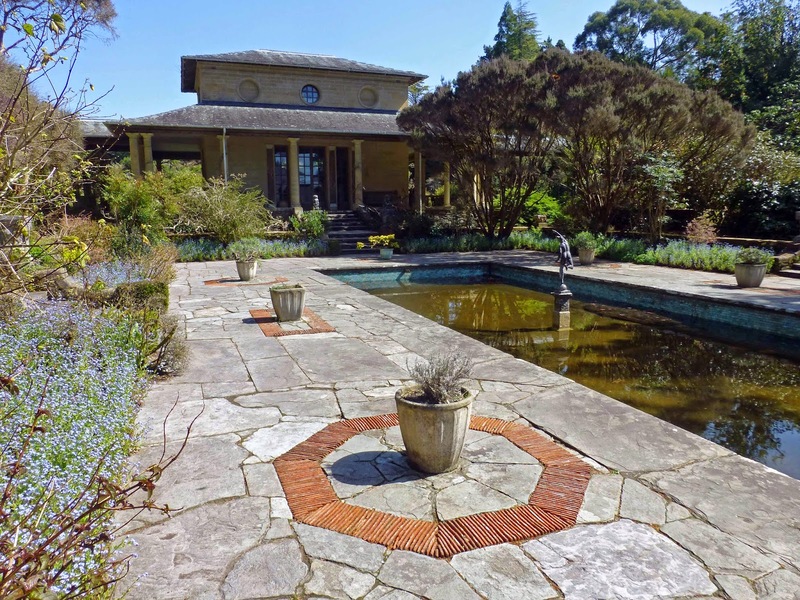 Garnish (€4.00 entrance) is an amazing mixture of gardens, arboretums, clock tower, Italianate buildings, even a Martello tower and will look even better in the weeks and months ahead as the trees, shrubs and flowers put on their summer show. Great views too over the bay and mountains. Back then on the ferry, and again a stop, this to say goodbye to the seals. Next call was to Manning's Emporium for a cool drink and a chat with Andrew. Manning’s will of course feed you, and feed you well, but we had a dinner date that evening. Soon we were making our way through Bantry and Skibbereen and then we got a lovely warm welcome as we checked into the spick and span Celtic Ross. That evening’s dinner was in the restaurant of the Clonakilty Hotel, very enjoyable too. Afterwards we spent a hour or so in the Celtic Ross bar sipping a pint or two of Franciscan Well’s Rebel Red, available on draught. After a hearty breakfast we were off on another island trip, making the short journey to Baltimore to connect with the ferry (€10.00) to Sherkin Island. We thought we'd be the only passengers until a large bus parked up and some forty Italian students joined us. You’d be hard pressed to find a more well mannered, well behaved bunch. 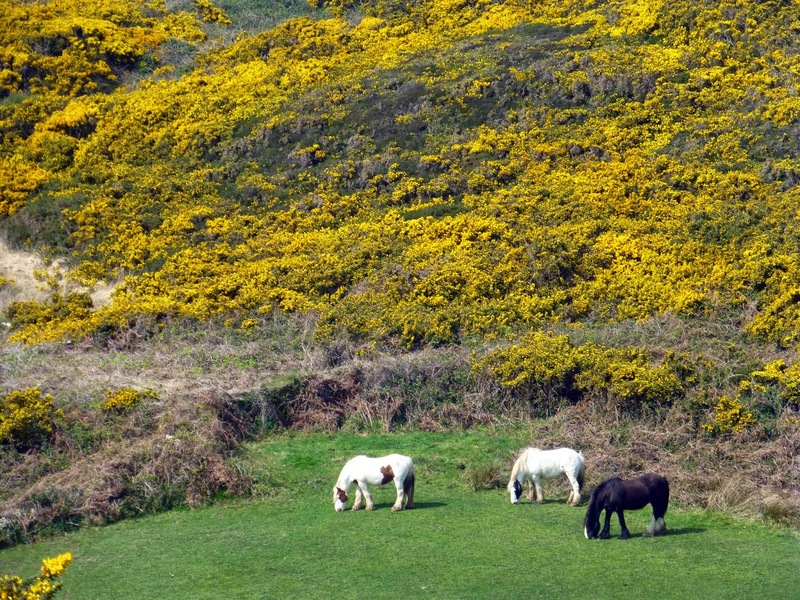 Like Garnish, Sherkin is noted for its peace and quiet. Some good walks too that we enjoyed though again the place will look better in a month or so when the fuchsias are in full bloom. 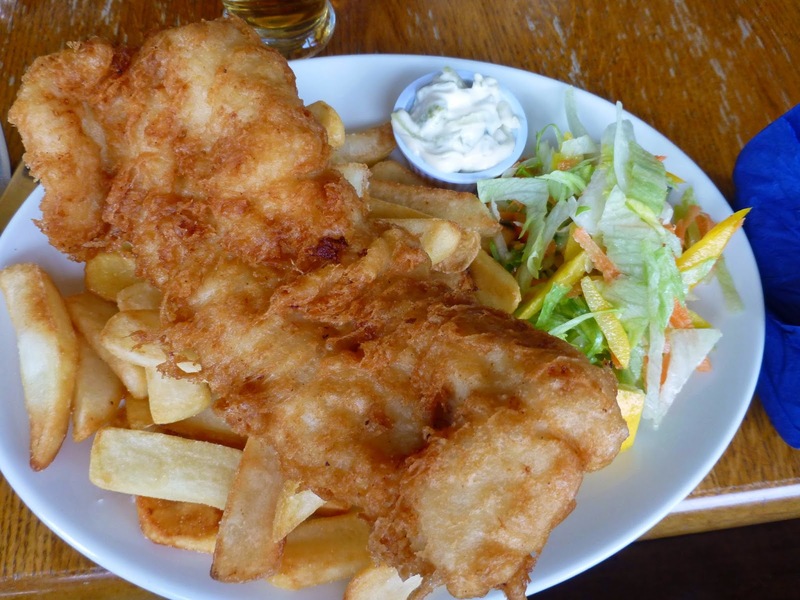 We made our way back towards the ferry point as lunch time approached and called up to the nearby Islander’s Rest where we got one (well two) of the best fish and chips ever. Hake was used and it was so well cooked. I don't know how many of you know about the pirate raid on Baltimore by Algerian pirates in June 1631 when 107 locals were taken away to be sold into slavery and never seen again. You can read all about it and indeed see some artifacts of the time in the newly restored Baltimore Castle (also known as Dún na Séad). More history too in this recently restored building that started life in the 13th century. An interesting visit (€4.00) and from the top you get terrific views over the town and the harbour. Off then towards Rosscarbery again, this time via the villages of Glandore and Union Hall (where you see from the memorial to those drowned at sea that it isn't always as nice as it had been to us these two sunny days). Dinner that evening was taken in the hotel dining room. With chefs of the calibre of Graeme Campbell and Alex Petit, we were expecting good things and that’s exactly what we got. The highlight was my main course of local pork belly served with a White Bean and Chorizo cassoulet. The pork comes from the Allshire’s nearby and is only available here. Well worth a detour. Indeed, our final visit on the following day was to Caherbeg to see the free-range pigs and have a chat with Avril about her busy life in food. It turned out to be a lovely visit, memorable for many things, including a lunch of her special Black-pudding lasagna! And the sun was still shining as we headed east and back to the city. Somebody's shopping arriving on Sherkin! Pearls of Portugal. Super Reds & A Port!